Electronics Costs > How Much Does the Roku Cost? How Much Does the Roku Cost? Roku players are well-recognized when it comes to streaming TV networks and movie services. Available in various models, Roku players offer more than 700 entertainment channels, have built-in WiFi b/g/n compatibility, and will stream at least 720p resolution content from Netflix, HBO Go, Hulu Plus, Vudu and more. Depending on the product you choose, the costs can range from as little as $30 for the Roku Express to as much as $109 for the Roku Ultra. Refer to our table below for the most up to date pricing. The Amazon’s Choice, the Roku Express, is currently the cheapest option available. NOTE: To learn about each model, refer to this product comparison PDF from Roku. When buying a Roku streaming player directly from the company, the following will be included: an IR remote or a game remote, an A/V cable, an A/C power adapter, a getting started guide, a 30-day money back guarantee, and a 90-day hardware warranty. 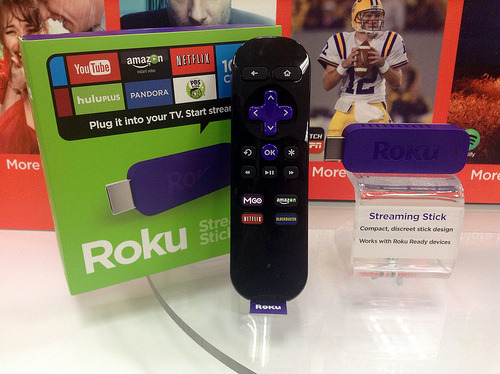 A Roku device can either be plugged into your TV or accessed via a specialized Roku TV. All Roku products offer you access to more than 500,000 movies and TV episodes from free and paid channels. They also offer tons of free content from major channels such as ABC, PBS and YouTube as well as live TV options. A 6-ft HDMI cable is advisable if you want top HD video and digital audio quality. This will cost $9.99 when bought directly from Roku and up to $25 when purchased at retailers. A Roku mounting system may also come in handy if you wish to attach the player to the back of your TV. It costs $9.99 at Roku and is sold by retailers at the regular price of $30. If you are going to use the Roku to stream media from providers such as Netflix or Hulu, a monthly subscription will be necessary. This expense is paid to the provider, not to Roku. Additional remotes and/or headphones, while optional, are often popular accessories Roku owners purchase. Roku channels, while optional, can cost extra, but there are plenty of free options if you want free content. To learn about the free channels, refer to this blog post on Roku.com. Inquire about the warranty. Generally, Roku warrants players against defects in workmanship and material for a period of 90 days from the purchase date. Ask about the warranty when purchasing a refurbished player. Purchasing a refurbished player from the manufacturer rather than from an independent re-seller is often recommended. The warranty may still apply or it may be transferred to you from the previous owner. When buying a refurbished Roku streaming player, make sure that the original documentation and accessories are provided. A Roku account is required to use the service; however, like most of the channels, an account is completely free to create. Aside from Amazon.com, the manufacturer, consider checking other third-party retailers to see if they can offer a better deal. If you do not mind buying a previously used Roku streaming player, consider getting one of the refurbished Roku players that are often made available online at rock-bottom prices. Buy directly from the manufacturer as it offers free shipping on any Roku purchase. Because there are different features of the Roku, research each model to see which one is best for you. Do not pay extra for features that you will not even use. Consider buying an older model for better deals. If you have a Smart TV, you may not need a separate streaming device as your TV may be able to launch the same apps a Roku can.